Report: U.S. Discussing 'Unilateral Strikes' On Terrorist Groups In Africa : The Two-Way As al-Qaida has fragmented, U.S. officials have turned their attention to loosely affiliated groups that present threats of their own. Officials tell The Washington Post that among the steps being considered are drone strikes aimed at terrorists based in North Africa. 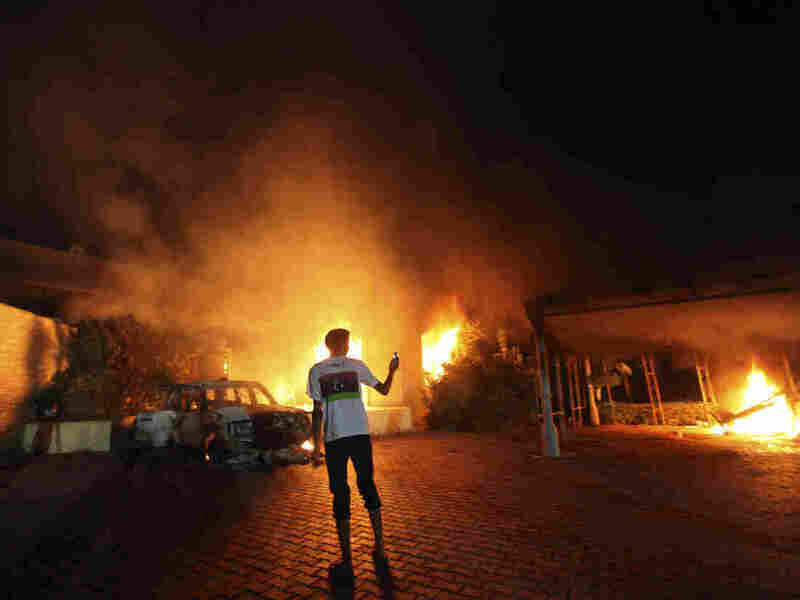 Sept. 11, 2012: A blaze erupted during the attack on the U.S. consulate in Benghazi, Libya. During a "series of secret meetings in recent months," the White House began to "consider for the first time whether to prepare for unilateral strikes" aimed at terrorist groups operating in North Africa, The Washington Post writes this morning. As NPR's Dina Temple-Raston has previously reported, while al-Qaida has "fragmented" in recent years because of U.S.-led efforts against the network responsible for the Sept. 11, 2011, attacks, U.S. officials' attention has turned to "a loose affiliation of groups that present a diffuse and entirely different threat." Those include "al-Qaida's arm in Yemen or Islamic militias in Somalia such as al-Shabab ... [and] in Nigeria, a local separatist group called Boko Haram." "U.S. officials said the discussions have focused on ways to help regional militaries confront al-Qaida but have also explored the possibility of direct U.S. intervention if the terrorist group continues unchecked." According to the Post, White House officials declined to comment on the record about the discussions.